Why the Apple phone got this much success? Since it will be a great device, if I was not the man stingiest of America, I could buy. The strategy as a whole, however, is based on what I call "iPod magic." Apple has succeeded with the iPod, the theory says. As a result, they can set foot in other categories and put them upside down. Even the press historically benign vis-à-vis Apple may have lack of discernment, both before and after the announcement of the iPhone. 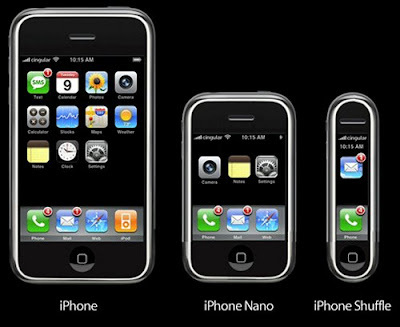 Also in December 2006, The Register published; Apple will launch a phone in January, which will be available during 2007. It will be a gem, a joy to behold, and its limited functionality will be easy to access and use. The Apple phone will be offered exclusively by the network in every major territory and some consumers change their operator just to get it, but not as much as some had hoped. As consumers begin to realize that the competition offers better functionality at a lower price by negotiating a better subsidy, sales will stagnate. After one year a new version will be launched, but the innovation of the first model it will fail and disappear quickly. Even John Gruber himself, he is also so quick to recall the failed predictions of his colleagues, was guilty of blunder on the eve of Apple's announcement; there are still only a few days, I do not expect Apple has a phone this week. But I changed my mind during the weekend, and I think since it is ultimately what is most likely. Not a VoIP phone, which depends on the Wi-Fi or anything of that order, but a real mobile phone pure juice. It seems that we should expect to say "Wow, I thought Apple could announce a phone but I do not expect them to do like that! ", But it is the devil if anyone knows what it is. My estimate would be unlikely but nevertheless enough to inspire: it will not be an iPod-phone, but rather the beginning of a new OS for mobile devices.